Whoever thought history could be so hilarious? Or moving? Or downright human? Evidently the writers and producers of the musical “1776,” the 1969 show that swept the Tony Awards in the face of stiff competition, had an inkling. And almost 45 years later, a lively revival at American Conservatory Theater (A.C.T.) in San Francisco, directed by Chicago’s great Frank Galati, underlines the point yet again. 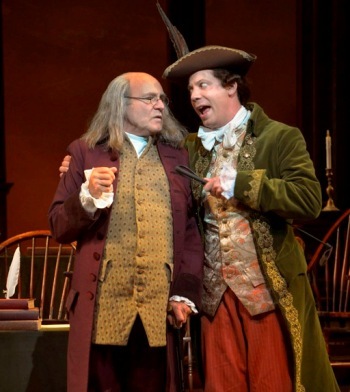 Ben Franklin as a dancer, in spite of the gout that crippled him in his later years; Thomas Jefferson as a young lover; John Adams as the “obnoxious” rabble rouser, disliked by almost everyone — and these are only the leads. In a cast of 26 characters, a majority of those — including the janitor (Steve Hendrickson) — are fleshed out and given their moment in the spotlight. And, in spite of the two-and-a-half hour running time, it goes by quickly. Let freedom ring! Adams (a wonderfully dry John Hickok) is the star of the show, followed closely behind by Franklin (Andrew Boyer as a delightful aphorism-spouting old curmudgeon). Jefferson (Brandon Dahlquist) is the third member of the triumvirate that pushed the Declaration of Independence through a reluctant and quarrelsome Continental Congress over a hot, long summer in Philadelphia against seemingly overwhelming opposition. And that opposition is masterfully portrayed, principally by Jeff Parker as John Dickinson, the royalist whose “Cool, Cool Considerate Men,” a paean to conservatives who move “always to the right, never to the left” is a highlight of the score, as well as Jarrod Zimmerman as Edward Rutledge of South Carolina, whose defense of slavery, “Molasses to Rum,” is perhaps the most powerful moment in the show. Unless you count Zach Kenney’s Courier, who delivers a first-hand account of conditions at the front, “Momma, Look Sharp,” that can break your heart. There are two women in the cast: Abby Mueller as Adams’ beloved Abigail, whose letters and wise counsel keep her husband from flying off the rails, and a delightful Andrea Prestinario as Jefferson’s young bride. Also of note, in smaller roles, are Ryan Drummond as the Southern blue-blood Richard Henry Lee, Alex Shafer as a Scottish colonel, Ian Simpson as John Hancock and Dan Hiatt as a drunken Quaker and well — everybody else.The players come from all over: many from the Bay Area, some from Asolo Playhouse in Pensacola, Fla., where Galati staged this show last year, and a number from Galati’s stomping grounds at Steppenwolf and Goodman Theaters in Chicago. Russell Metheny’s set design, a meeting room dominated by a tally board that records the ever-changing “yeas and nays” and a calendar that marks off the days until July 4, is a marvel of efficiency, and Michael Rice’s orchestra keeps things humming in the pit. But the most stirring bit of music is the pealing of the Liberty Bell at the very end. “1776” reminds us that the birth of a nation, like the birth of a baby, is not all picnics and fireworks. It involves blood, sweat and tears.